Got the original for free but plan on dropping full price on this! We should start up a dvd talk group when this hits. I bought the first one w/ all DLC for under $20 (used). I fully expect to spend around $110 on this title (assuming they have the same amount of DLC for this). Take that used game sales! Couldn't agree more. I sort of miss the old days when there was a DVD Talk Xbox group that really hit it off with the original Halo. Borderlands was pure coop fun and I'm sure this will up iot even more. Cool preview write-up on Kotaku. Some early DLC news from PAX East? My feelings exactlly but I can wait. To much to do around the house between now and then plus it looks like with several playing thru Boarderlands 1, it'll give them time to complete and get ready for "2". I'm pumped!! Isnt' Bioshock coming out in september too? If so this could be the "Sept 12 = Great gaming month ever!" As it stands now...Bioshock Infinite is scheduled for Oct 16....the trailers have been nothing short of breathtaking. Well the new class is called the "Mechromancer", but it won't be ready for launch and will be dlc later. At PAX East this year, there is no overlooking the fact that Borderlands 2 sits atop the list of most anticipated games for many of the attendees. Much of the game’s changes and character customization has been detailed before, but Gearbox Software still has a few tricks up their sleeve. 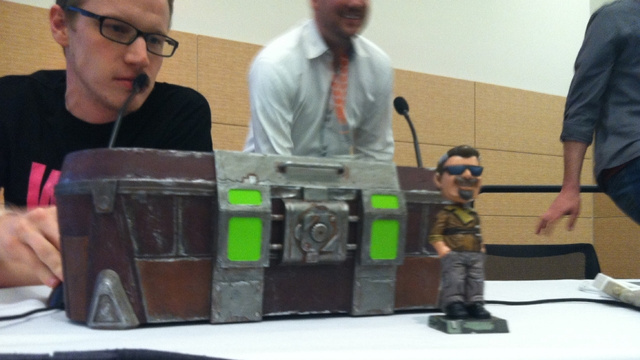 During the company’s panel, Gearbox CEO Randy Pitchford unveiled the brand new Mechromancer Class. The new character type is still in the conceptual stages, so owners of Borderlands 2 will be receiving the Mechromancer as DLC 60-90 days after release. Obviously when gamers hear the words ‘DLC’ and ‘character class’ in the same sentence the worst is immediately assumed. However, this case is something entirely different. Pitchford was completely open during the panel about the fact that the Mechromancer is still in the early, early stages of development. The team has ideas about what they want to do with the character class, but nowhere near enough time to complete it and implement it into the existing game. As such, the character will be tackled wholeheartedly only when Borderlands 2 moves into certification and the team can direct the necessary resources. 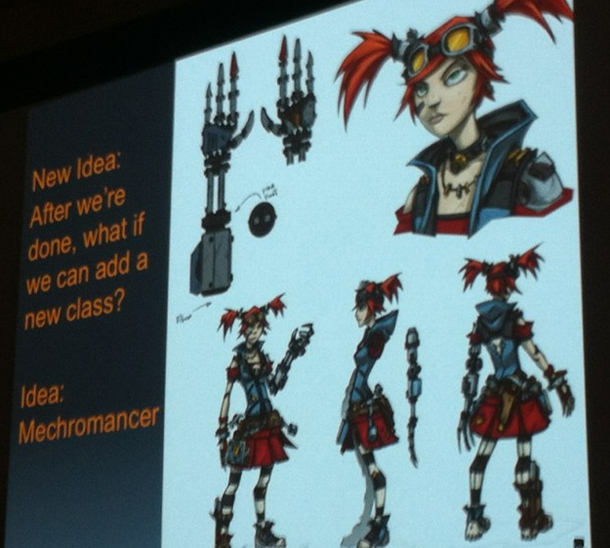 So far the team only has concept artwork, depicting the Mechromancer as a diminutive steampunk girl whose abilities seem to extend beyond her own physical strength. Along with the character herself, one sizable murder-bot dubbed ‘Deathtrap” was also shown in concept artwork. For those who pre-order the game (or presumably purchase it at full price) the Mechromancer DLC will be downloadable for free when it is released. Otherwise, players will be spending a bit more for access to the character class. Aside from adding a player class to the numerous pre-order goodies for Borderlands 2, this reveal goes a long way to back up Gearbox’s claims that they are dedicated to making the sequel far less repetitive than the original Borderlands. Some might complain over the delayed content on the grounds that it should have been thought of and developed sooner, but the development team has to be commended for adding content to their game even this late in production. The 60-90 day window given by Pitchford can also be understood, since the expanded skill and ability trees for the Mechromancer will need to be built and balanced from the ground up. With Borderlands 2 set to release in September, time just wasn’t on their side. What do you think about Gearbox’s desire to follow through on a good idea, even if it means later DLC offered free to owners? Is this case of Gearbox’s customer support extending beyond release something you’d like to see more of, or preemptively avoided? Who really pre-orders any game nowadays? Pushing pre-orders is something that Gamestop does to get you to commit to buying the game from them. I preorder all the time for the bonuses and most of the time there are credits. That is a very compelling reason to preorder. Every game that I want day 1 gets pre-ordered, 99% of the time from amazon. I always pre-order from Amazon. Why wouldn't I with their price guarantee and release day delivery? Why would anyone wait until day-of to buy anything when all the deals are known in plenty of time to change plans if necessary. Yeah, if I pre-order from amazon, I get it on release date w/ free shipping and no taxes, so it's kind of a no-brainer. Have it on pre-order from Amazon! I honestly forgot about Amazon pre-orders and their bonuses although they have been somewhat lacking in that department lately. My comment was really directed at the idea that you really have to pre-order the game to get it day of release which no longer seems to be true with most releases. You would be surprised at how many people pre-order with virtually no bonus at gamestop. This may be the first game I have ever pre=ordered depending on what all is in the LE and how limited it is. That Loot Chest edition could be pretty sweet. Same here...especially the "tax" part but it won't last long here. Amazon is building a warehouse close by and so paying the taxes will come later. but I pre-order if the bonus is good and if there is a $10 credit. A no brainer if the credit goes to $20. I'm pre-ordering Ghost Recon: Future Soldier from Amazon. And yes...it will be a killer Sept and Oct.
Weird. Is my picture from twitter not showing for you plebeians?